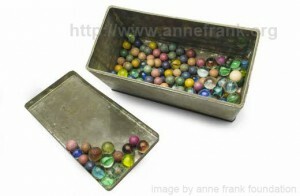 Almost seventy years after the Second World War marbles owned by Anne Frank are rediscovered. Toosje Kupers, former neighbor of the family, gave the marbles to the Anne Frank House. Toosje she received from Anne when the Frank family had to leave their house at the Merwedeplein and got to hide for the Nazi’s on the Prinsengracht in the “Achterhuis”. It was for me just a metal box marbles, said the 83-year-old Kupers. For decades the metal box was stored in a closet. Only for the grandchildren they were sometimes used for toys. She had never thought they would be. Valuable to the Anne Frank House. It is great to have these items in our collection said a spokesman from the Anne Frank House. We know that before she and her family moved to the hidden secret location she was a happy little girl playing outside like kids of that age do. Now we have physical evidence of that periode and we are very thrilled about it.